We have come to drag days: DINO-MITE! 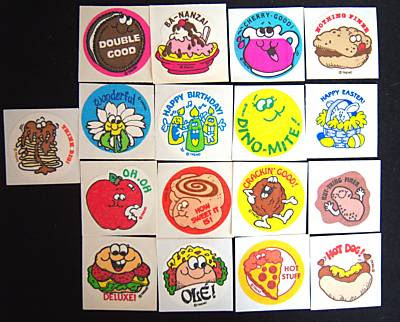 In a rush of irrational nostalgia, I almost bought these scratch-and-sniff stickers on ebay for 20 bucks. For some reason, I had to smell that gross hot dog one more time. Sadly, absent from this lot was the sublime "motor oil" sticker. Yes. Motor oil. I remember scratching and sniffing the lemony DINO-MITE sticker so many times it had a hole in the center. Oh wow, those are a nice trip down memory lane. I remember the same exact DINO-MITE sticker. i had the peanut one. smelled like a little round piece of heaven. Oh, i miss stickers! I think I will invest in stickers instead of stocks. they seem to appreciate more and they still smell after 20 years, that is amazing!